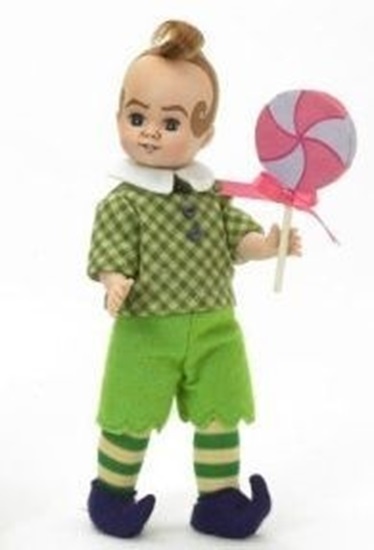 Lollipop Munchkin is an 8-inch bent knee doll introduced in 2007, and now retired, from the Wizard of Oz collection. From Madame Alexander's Wizard of Oz series we are pleased to share with you Lollipop Munchkin, an 8-inch doll with blue sleep eyes and stylized painted hair and eyebrows. He is wearing a greem and white gingham shirt with a white collar and purple buttons, green felt shorts, and green and white striped leggings with purple felt pointy "elf" shoes. An pink and gray swirled screen printed lollipop completes this ensemble. This Lollipop Munchkin was introduced in 2007 and is now retired. This is our last one.